Personal: He graduated from Easton High School in 1956 and received a full four year scholarship to the University of Texas A&M. he was a veteran of the Army and was stationed in Fort Dix in New Jersey. 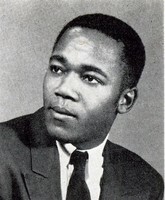 He served his country faithfully until being honorably discharged on May 10, 1958. He was a great football player and in his later years an avid golfer. He retired from PP&L Electric Co. after 31 years of devoted service. Survivers: He is survived by three sons, William "Peanut" Washington of Reading, Pa., Darrell Washington of Harrisburg, Pa, and Jerry Keys of Steelton, Pa; a daughter, Cassandra Washington and a devoted companion, Stephanie Keys, also of Steelton, Pa; two sisters, Mildred Gilbert of Easton, Pa, and Willie Mae Evans of Pleasanton, Ca; four grandchildren; nieces and nephews, great and grand. His wife, Mercedes, and a son, Darin, both died earlier. Services: William's homegoing was held Friday, July 14, 2006 at My. Zion Baptist Church, Steelton, Pa. interment will take place Tuesday at 10 a.m. in the Indiantown Gap National Cemetery, Annville, Pa.